David Kerby-Kendall’s low-key two-hander is perfectly suited to the intimate setting of Jermyn Street Theatre. At times it feels like the audience are eavesdropping on private conversations, which seems fitting given that the play is about emotional closeness. 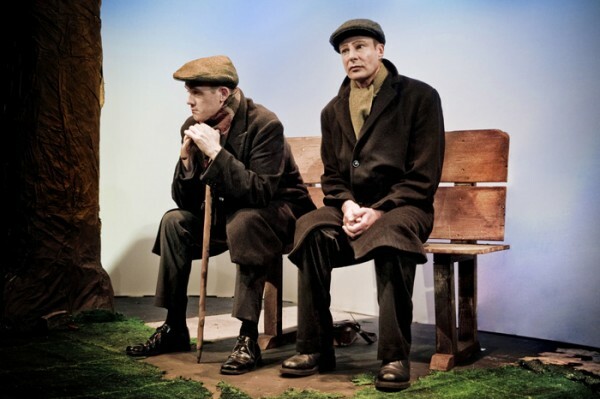 Two friends, Paul (played by Kerby-Kendall) and Jamie (Lucas Hare), return at six pivotal moments throughout their lives to a place that is special to them both: a secluded park bench shaded by a single tree. The play uses this recurring location to trace the path of their friendship over the course of their time together, from the age of seven to the age of eighty-nine. The moon hangs over Paul Burgess’ set, acting both as symbol of continuity and mortality and, more prosaically, as something on which to project scene-setting clips in order to show the passing of time. When we first encounter the characters as children, they exude a certain kind of amiable public school innocence and the performers throw themselves with gusto into the task of making them believable as young boys. This is followed by their teenage years, scenes of sexual awakening, as they discover the twin joys of girls and masturbating. Of the two, Jamie is more of the ladies’ man, an able foil to the intellectual but socially incapable Paul; he even takes it upon hinself to teach Paul how to kiss. This admirably truthful portrayal of adolescent angst gradually escalates into something more laddish. The friends get drunk and laugh about their exploits, a scene which is repeated many times throughout their adults lives, and while this is perhaps intended to reveal their ‘young at heart’ attitude, as a device it seems overdone, especially when war, marriage and divorce start to invade their lives. Yet throughout all this their friendship remains their one constant, their chief source of emotional support. As the characters grow old reluctantly, their nostalgia for the escapism of their childhood intensifies. The two men reflect on life and the people they have come to be, on ‘the billion things that make us who we are.’ These discussions are thought-provoking to an extent, but occasionally they stray towards didacticism and one sometimes feels like one’s being fed the writer’s personal philosophy. Where Joe Fredericks’ production excels is in its sense of fun and in its sympathetic portrayal of a relationship that doesn’t quite fit social boxes; there are elements of homoeroticism between the men but theirs is not a love affair, repressed or otherwise, or at least not a sexual one. In fact the writing could have been braver in this regard, in stepping outside the definition of conventional masculinity: as it is, the play conforms to as many norms as it confronts. The dialogue too, though genuinely funny and moving at times, has a tendency to pile on the clichés. There are places where it just doesn’t ring true and the final scenes end up feeling excessively schmaltzy rather than gently poignant.